The Crimson-bellied Conure or Crimson-bellied Parakeet (Pyrrhura perlata) - more commonly known as the Crimson-bellied ) - is also often referred to as "Pearly Conure" resulting in confusion with the Pyrrhura lepida lepida - the true Pearly Conure. 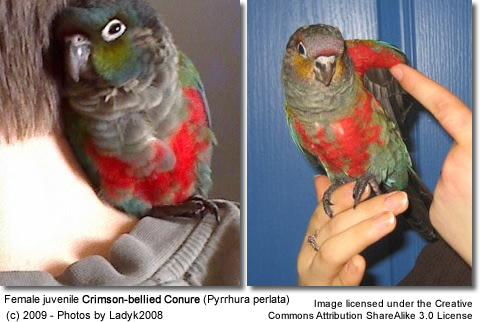 The reason for this confusion is that the scientific name " Pyrrhura perlata" is now applied to Crimson-bellied Parakeet. In 1824, Spix misidentified skins of immature birds belonging to the former species "Pyrrhura rhodogaster" necessitating reclassification. Recent field studies have confirmed a conspecific relationship (of, or belonging to, the same species) between Pyrrhura rhodogaster and Pyrrhura perlata, thus they are classified here together as one species. The Crimson-bellied Conure forms a parapatric species pair with the Pearly Conure (Pyrrhura lepida), with which the Crimson-bellied Conure is sometimes considered conspecific (of, or belonging to, the same species).. The Crimson-bellied Conure is endemic to the subtropical and tropical moist lowland forests in the south-central Amazon Basin in in Cumã Bay, Maranhão west to Belém and Rio Capim, Pará in northern Brazil south of Amazon between Madeira and Tapajós Rivers and Bolivia. At this point in time, it is considered common in its natural habitat; however, its numbers have been declining. The plumage is mainly green with a narrow reddish-brown frontal band. 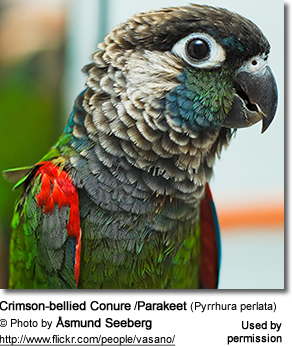 The most distinguishing features of this conure are the bright crimson-red colored lower breast and abdomen - and that color can also be seen on the bend of wing and under wing-coverts. The forehead, crown and back of the head are dull brown, each feather edged with whitish-brow. The forehead has a pale-blue tinge. The feathers on side of neck, throat and upper breast are brown each feather being broadly edged with whitish to dull yellow. Adults have a blue collar on the hindneck in varying thicknesses. The brown cheeks are washed with a dull blue. The lores (the regions between the eyes and bill on the side of a bird's head) and cheeks yellowish-green becoming pale blue on lower cheeks. The ear coverts (feathers covering the ears) are off-white / cream-colored. The brown breast is barred off-white and dark brown. They have a brownish-red tail with a green base. The bill is dark grey and the feet grey. The eye rings are bare and off-white, and the eyes dark brown. Immature birds look like adults, but they have a duller plumage, green abdomen and dark irises. They have variably mixed blue and a few red-edged feathers - some young fledge with adult plumage. Sexing: Undeterminable by appearance. Males and females look alike. DNA or surgical sexing is recommended. Looks in many ways like the Crimson-bellied Conure, except the lower breast, abdomen and thighs of the Pearly Conure are mostly green. 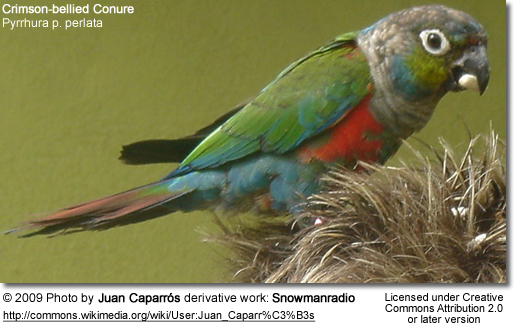 The edging to the breast feathers is also narrower than that of the Crimson-bellied Conure. Both male and female look like the nominate species (lepida) featured above, but the forehead is without blue tinge and the breast is grey-brown with regular narrow edging and with a strong blue wash reaching up to the throat. The under tail-coverts usually blue. It averages 24 cm or 9.5 inches in length. Slightly larger than the nominate species featured above. Adults look like the nominate species, but the lores (the regions between the eyes and bill on the side of a bird's head) and upper cheeks are green, turning blue on the lower chest. Adults lack the blue wash on the breast that can be seen on the other sub-species. The green bend of the wing and underwing coverts are green with minimal or entire lack red markings. They have green underwing coverts and leading edge of wing as opposed to the red that can be seen in the other sub-species. 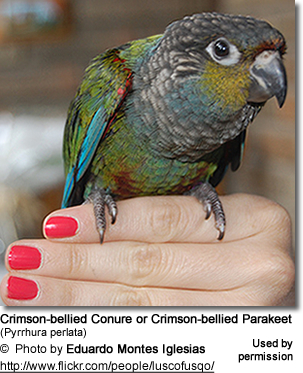 Crimson-bellied Conures are generally quiet and they are usually only vocal when excited. They quickly grow confiding. 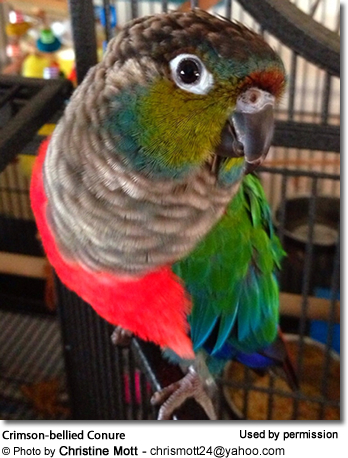 These are lively and active conures that enjoy flying about, so plenty of space should be provided. They tend to be hardy and are not as susceptible to diseases as some other bird species are, especially when provided good nutrition and suitable environment. They enjoy bathing often. The chewing requirement varies from pair to pair. It is important to provide a regular supply of fresh branches to satisfy their chewing urges as well as to provide entertainment. They are not usually aggressive to other birds. The vividly colored Crimson-bellied Conure is a playful bird, and can easily be trained to do tricks and maybe even to speak a few words. 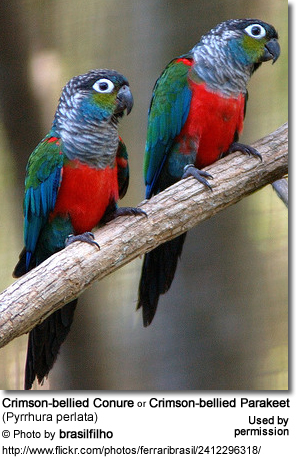 Even though Crimson-bellied Conures are comparatively quieter than other conures, they are still noisier than say cockatiels or budgies. Natural diet: Their main diet consists of fruits, flowers, seeds, berries and nuts. They regularly visit barreiros (places where mineral-rich soil is available) to feed. Captive Diet: They should be provided with plenty of fruit, vegetables and greenfood; as well as a regular supply of branches with flowers and buds. A good quality seed mix of safflower, oats, some sunflower (also sprouted), hemp, buckwheat, millets, canary seed and rowan berries should be available at all times. They also enjoy millet spray and should have access to mineral and vitamin supplements. Bird nutrition and recommendations for your pet bird. 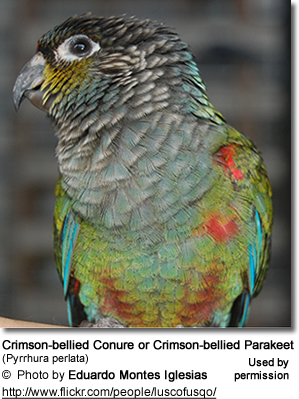 Crimson-bellied Conures are rare in aviculture and difficult to obtain. Breeding the Crimson-bellied Conure is more difficult than the other sub-species as they often produce infertile eggs and the hatching success is very low, as they are prone to mutual disturbance; therefore, it's best to isolate pairs during breeding. 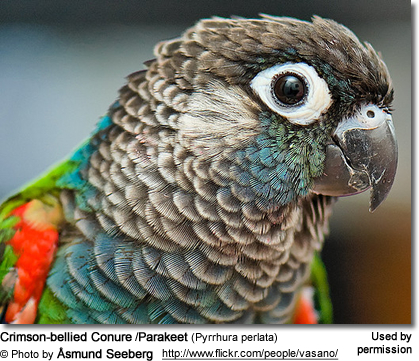 These conures are generally quiet and they are usually only vocal when excited. They quickly grow confiding. These are lively and active conures that enjoy flying about, so plenty of space should be provided. They tend to be hardy and are not as susceptible to diseases as some other bird species are, especially when provided good nutrition and suitable environment. They enjoy bathing often. The chewing requirement varies from pair to pair. It is important to provide a regular supply of fresh branches to satisfy their chewing urges as well as to provide entertainment. They are not usually aggressive to other birds. Though they may breed all year, the main breeding seasons are from August to November and the second usually starts in April and goes on until June -- probably depending on the availability of food and favorable conditions. They lay about three to six eggs measuring 1.01 x 0.83 ins or 25.8 x 21.0 mm. These eggs are incubated for 23 to 26 days. The young fledge when they are about 50 days old. Two breedings a year are possible. These active conures should be provided a spacious aviary. The minimum dimensions of which should be 9 x 3 x 6 ft or 3 x 1 x 2 m (or larger). They should be protected from temperatures below 50°F or 10°C. In colder climates, a heated shelter needs to be provided. If the breeding birds are not accepting the box they are given, it is a good idea to offer several boxes of varying sizes and types. Place them in different areas of the flight, and see which one they choose. Once you have identified the box they like, all the others can be removed, cleaned and used elsewhere. A nest box should be provided all year long. Marcy Covault from Feathered Companions Aviary suggests using a deeper box, either a bootbox or a vertical grandfather box (18" - 24" deep). Other breeders provide nest box with the following dimensions: 8 x 8 x 30 inches or 20 x 20 x 70 cm. Some conures do accept cockatiel-sized boxes, but using a deeper box will reduce the conures' tendency to remove the shavings and lay their eggs on the bare wooden base. Nest inspections are generally not tolerated. If nest inspection is necessary, wait until both parents have left the nest. They can be aggressive and protective of the nest area when breeding. Description: Both male and female look like the nominate species (lepida) featured above, but the forehead is without blue tinge and the breast is grey-brown with regular narrow edging and with a strong blue wash reaching up to the throat. The under tail-coverts are usually blue. This conure averages 24 cm or 9.5 inches in length. Distribution: Miritiba, near the Coast of Northern Maranhao - narrow coastal area in northern Maranhão, Brazil ... Endangered, approaching extinction, possibly already extinct because of extensive deforestation. Description: At an average of 25 cm or 10 inches in length (including tail), the Neumann's Pearly Conure is usually slightly larger than the nominate species featured above. Adults look like the nominate species, but the lores (the regions between the eyes and bill on the side of a bird's head) and upper cheeks are green, turning blue on the lower chest. Adults lack the blue wash on the breast that can be seen on the other sub-species. The green bend of the wing and underwing coverts are green with minimal or entire lack red markings. They have green underwing coverts and leading edge of wing as opposed to the red that can be seen in the other sub-species. Distribution: Their native habitat can be found in the lowland rain forest areas and secondary vegetation in Rio Fresco (tributary of Rio Xingú), Rio Pracupi and around Arumattra on left bank of Rio Tocantins, Pará, in Brazil. Outside the breeding season, they are often seen in groups of 3 to 8 birds perching in high branches of trees. They prefer dense primary and secondary vegetation and are usually well hidden in the foliage. They are cautious and watchful and, if disturbed, they chatter loudly. They visit water courses and rivers to bathe, and are often seen together with Painted Conure (Pyrrhura picta) - particularly at barreiros.